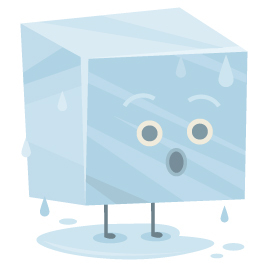 Ice (Cold) vs Heat - What's Better to Treat Hip Strain or Hip Bursitis? You Have Been Dealing With A Strained Muscle In Your Hip For Over 5 Months. You haven't felt any pain in the area for the last week now, so you decide to head out for a 10 minute walk to get some fresh air. You realize near the end of the walk that the familiar pain is back and you are limping. Use COLD on your hip to stop further damage to the micro tearing in your hip muscle and help ease the inflammation and pain. Before getting active next time, do light stretches and apply a Back/Hip T•Shellz Wrap® treatment to the affected area 30 minutes to 1 hour before undergoing the strenuous activity. It will help limber up the area temporarily and lower the risk of re-straining the injury during this period. You Occasionally Feel Sharp Pains In Your Inner Thigh (Groin) That Shoot Down From Your Hip. You're not sure if you have an injury, but this pain seems to come and go only when you do a lot of walking, exercising or any twisting / pivoting on your leg. When you feel the sharp pain, the pain will continue to radiate in your groin for a few hours after and your leg feels weak. Go See You Doctor to Get a Proper Diagnosis. Use a Cold Compress or Ice Pack as needed to reduce the radiating pain and any potential inflammation. If you feel like the area is tightening up, use the T•Shellz Wrap® treatment when getting up in the morning or before undertaking activity. 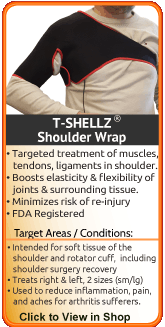 When Should You Use A Back/Hip T•Shellz Wrap® (Deep Tissue Heat) To Treat Your Hip? DTR Therapy should not be used directly after an injury, as you must wait for swelling to drop. DTR Therapy treatments should not be started for a least 2 weeks after surgery because inflammation levels will be very high as the healing process starts over again. Any use of DTR Therapy should also be combined with gradual movement to stretch out your hips and increase range of motion. 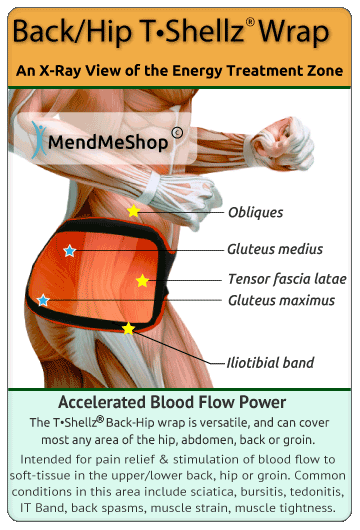 If you have a chronic hip injury that keeps getting re-injured or muscle spasms in the lower back, glutes, hips, abs, or thighs you should use a Back-Hip TShellz Wrap before activity to loosen up soft tissue (making it more flexible). This treatment is shown to increase the elasticity (flexibility) of the soft tissue in and around the treatment area, making it more pliable for activity and less likely to re-injure. Sometimes we feel pain while doing a certain activity - should you still use DTR Therapy? 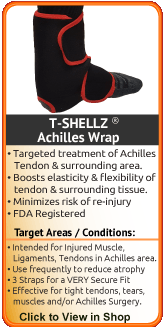 Using a TShellz Wrap in the morning before you start your day or before activity can help to boost blood-flow and reduce risk of further strain or injury. Use cold part-way through your day after you have been active so you can decrease pain and inflammation from the flare up. Using a Back-Hip T•Shellz Wrap® is a good long-term plan as this deep heat will not only stimulate healing (via enhanced blood flow) - it can also be used on a preventive basis to relax constricted soft tissue (increased elongation & flexibility of muscles, ligaments and tendons). DTR Therapy indirectly enhances the local blood circulatory system, increasing the flow of nutrients your soft tissue needs to heal - oxygen, nutrients, anti-bodies and energy. What Makes the Back/Hip TShellz Wrap Different? Instead of having the heat energy force itself into your body by heating up the skin first, the Back/Hip TShellz Wrap emits an electromagnetic energy (EMR) that penetrates deep into your tissue creating the heat right down in your injured tissue. This means that instead of trying to heat from the outside in, you're using another method to to get the energy straight inside; EMR energy passes right through the skin and is absorbed by deep dense tissue - exactly where it is needed. The most common soft tissue hip injuries are debilitating. At a minimum, they will impede your ability to extend and contract your hip joint. Being unable to move your legs in these ways will majorly interfere with everyday tasks like getting dressed, driving, working or reaching for anything. When it comes to using ice and heat for treating a bad hip, it's important to keep in mind that both ice AND heat are very effective ways to relieve pain and heal. Most people will think one is better over the other from their own experience or what a doctor / physical therapist has previously told them specific to a previous treatment plan. Each temperature therapy has its own unique benefits for healing of soft tissue, and when used together they provide a powerful advantage to long-term healing. You may already know that ice or heat feels better on your hip, and this could influence your decision too. The bottom line is that ice and heat are exceptional, natural, pain relievers and healers for soft tissue injuries. When we say soft tissue, we are talking about muscles, tendons, ligaments, cartilage and bursas. There are cases where some hip injuries will respond better to 1 temperature over the other. We want to help clear up the confusion so you know which is better (icy cold or gentle heat) and how to get the most from your treatment at home. How Do You Use Ice / Cold as Pain Relief for Your Hip Injury? COLD (ice) is used to treat injuries or conditions that are red, hot, inflamed, swollen and suffering from tissue damage (a tear or recovering from surgery). Cold therapy is a natural / organic pain reliever that numbs pain right at the source of your injury. While doing this, the cold also stops cellular break-down and reduces the amount of scar tissue forming (this is very important after surgery). When cold is applied to a hip injury, soft tissue in the hip will constrict and squeeze on the blood vessels to slow down your blood flow. This in turn clamps down on the amount of fluid leaking into your injured tissue, decreasing swelling. This is why cold is used immediately to treat acute (recent) injuries or re-injuries - basically, newly damaged soft tissue. The cold slows down your body to reduce the amount of damage happening to soft tissue and decrease the swelling. This cold also has a nice side benefit of numbing nerves in and around your hip, further decreasing your pain. Cold can Make Your Soft Tissue Injury Worse - How? Applying cold can restrict blood flow and stiffen / tighten soft tissue. Cold is NOT a good treatment method for soft tissue tears or strains when the tissue is already tight and constricted, because the cold will just stiffen the tissue further. Instead, use a therapy that will increase blood flow, like the Back/Hip T•Shellz Wrap® (Deep Tissue Therapy) to increase localized blood circulation, and relax / elongate soft tissue, making it much more pliable. 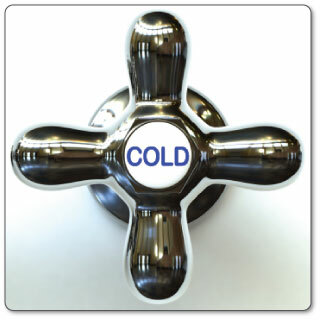 If you've been suffering for some time with a chronic hip cuff injury you should only use cold after activity causes you more pain or triggers more inflammatory response symptoms (red, hot, inflamed, swollen).. This would be when your hip, outer thigh or lower back starts to hurt at the end of the day after you've been on your feet throughout the day. When used at this time cold compression becomes a natural / organic pain reliever, targeting the localized site where you feel the pain. Sometimes we feel pain while doing a certain activity - should you still use cold? Too much cold therapy can reduce your ability to heal correctly, because cold is a short term pain reliever, not a deep tissue healer. This is important because once blood vessels are blocked or damaged, they can no longer carry oxygenated blood through the tissue and tissue cells begin to break-down. Without cold therapy, cellular break-down and tissue damage continue as cells don't get the oxygen they need to survive. By limiting the amount of damage done to your hip, you also limit the amount of healing that needs to occur. This is an important step to heal hip joint injuries faster and with less pain! to Treat Your Hip Pain? 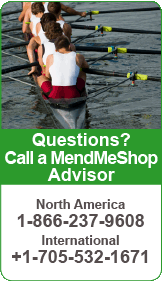 Call one of our MendMyHip Advisers at no cost or obligation to address any lingering questions you have about using cold for your hip injury. 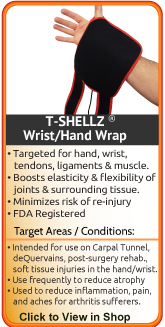 How Do You Use a T•Shellz Wrap® (Heat) to Heal a Soft Tissue Injury in Your Hip? HEAT (warmth) is used after you've reduced your swelling / inflammation and the sharp pain is less intense (you have more of a dull / nagging ache and soft tissue tightness in your hip). Warming up deep tissue is a natural way to encourage healing of muscles, tendons and ligaments. Increasing the temperature of this deep tissue will result in increased blood flow circulation as the body sends more blood there to attempt to remove this same heat. It's the blood in your body that will bring oxygen, nutrients, antibodies and energy to your injured hip to help with healing. When heat is applied to deep tissue in the hip, veins will start to get bigger (expand) to allow more blood flow through to your damaged or torn soft tissue. This in turn relaxes your hip, making the tissue more flexible and elastic. This is why heat is used on older (chronic) injuries, to loosen tissue and bring in the blood flow needed for healing. Your body will begin to heal itself after it is injured - increasing your blood flow with heat will speed up this natural process - often surprisingly well. 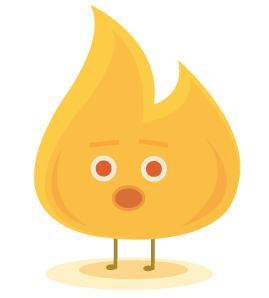 Adding 'heat' to your hip when it's already inflamed and tender may make your body think there's a new threat to your tissue and increase the pain in order to get you to stop. For some people applying heat on inflamed / swollen tissue will cause the injury to swell-up even more (as much as 3 times larger than normal). You'll feel even more pain as the pressure builds in your hip. Heat is NOT a good treatment method for inflamed soft tissue, new injuries (within the first 24 to 72 hours), right after surgery or right after a re-injury (over-use and/or sharp, throbbing pain). In these cases, heat should be applied later on in the healing cycle. In the meantime, use a Cold Compress or Ice Pack to decrease any inflammation induced pain. 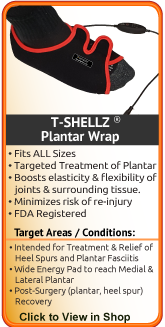 A T•Shellz Wrap® temperature treatment works best to increase blood flow circulation and stimulate healing for older (chronic) injuries, re-injury (after swelling has been reduced) and during long-term post surgery recovery. Warmer temperatures should be used approximately 3 to 5 days after you first have the injury. Heat should not be started for a least 2 weeks after surgery because inflammation levels will be very high as the healing process starts over again. Any use of heat should also be combined with gradual movement to stretch out your hip and increase range of motion. If you have a chronic hip injury that keeps getting re-injured you should use heat before activity to loosen up your tissue (making it more flexible). When used at this time the warm temperatures naturally extend the elasticity (elastic-nature) of the joint, making it more movable / pliable for activity. 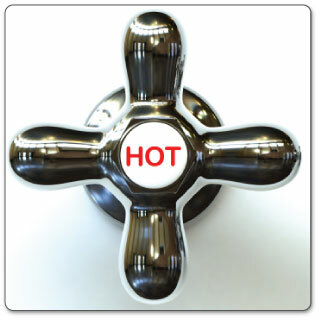 Sometimes we feel pain while doing a certain activity - should you still use heat? Using heat in the morning before you start your day or before activity can help to boost the healing process and reduce your risk of re-injury. Too much heat (especially when you suffer a set-back with swelling / inflammation) can make your inflammation worse. Cold treatments with a Cold Compress or Ice Pack should be used part-way through your day when you suffer from on-going pain and inflammation as a natural pain-reliever. Keep using Deep Tissue Regeneration Therapy before activity and when you notice any stiffness in your hip to 'warm up' your muscles, tendons & ligaments - and stimulate healing. Using heat is a good long-term plan because it will continuously assist in your body's healing process. It can also be used on a preventive basis to relax constricted soft tissue. We use warm temperatures / heat to speed up the process of baking something in the oven or melting the snow outside, your injury is no different. Heat will speed up the natural healing rate in your hip by increasing your blood flow circulation. This in turn brings all the components your tissue needs to heal - oxygen, nutrients, anti-bodies and energy. The goal of this web page is to give people the information they need to use simple, effective, natural treatments like ice and heat to heal their injury. We can give you the information you need to understand how to use temperature therapy (at home) to relieve your hip pain and heal your hip. If you want to discuss options with one of our trained MendMyHip Advisers call our office toll-free at 1-866-237-9608 or Internationally at +1-705-532-1671. There is no cost or obligation to this service. We all want to begin healing as quickly as possible and with the right information, it can happen sooner than you think. It has for thousands of others who took the time to contact us). 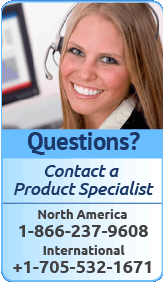 You can be assured we will do our best to answer any question or concern you have. Living with hip pain is never easy and we can help to provide answers about prevention, causes, treatment options, and ways to manage your injury for the short and long term. For many people, the treatment won't just end there. Stretching is also an important part of of deep hip healing - and it's the final step needed when healing your injury with conservative treatment methods. You would be surprised by how many people there are that don't understand the importance of stretching a deep tissue hip injury. Before returning to full activity after a hip injury, physical therapists prescribe gentle stretching of the affected area... This is because stretching an important part in recovery from any soft tissue injury. Consistent stretching is one of few solutions available to break up scar tissue that forms on your hip as it heals. Stretching with use of a Cold Compress or Ice Pack and T•Shellz Wrap® is even better! A Deep Tissue Therapeutic T•Shellz Wrap to increase elasticity of tissue and stimulate blood flow in the injured hip before stretching. A Cold Compress or Ice Pack to reduce pain and inflammation in the affected tissue after stretching. For this 1st step many physical therapists will use heat, manual manipulation, deep tissue massage, clinical ultrasound devices or a warm bath to warm up your hip. The goal during this first step is to increase healthy blood flow circulation and relax your affected hip. 'Warming up' your hip will increase the elastic-nature of your hip fibers making it much easier to stretch and when needed, hold the stretch. This will also extend the amount that you will be able to stretch your hip. 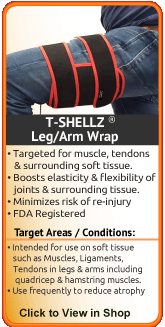 Use an T•Shellz Wrap® for 15 to 20 minutes at least half an hour before stretching your hip. 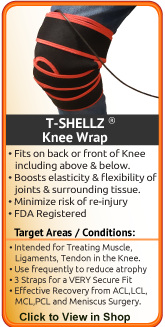 An T•Shellz Wrap® will promote Deep Tissue Regeneration Therapy (Deep Tissue Therapy) - a therapy that will increase the blood flow to your hip while warming up and relaxing your injured tissue. Deep Tissue Therapy will make your hip fibers more elastic and pliable, allowing for more ease of movement when you're stretching and/or exercising. Continued treatment with Deep Tissue Therapy will also deliver much-needed oxygen, nutrients, antibodies and energy to your hip. This will boost your own natural healing ability and speed up your time for recovery. The main goal of physical therapy is to exercise (stretch out) the affected hip to improve flexibility and range of motion. After the physical therapist has warmed up your hip, they'll get you to do a series of exercises that are focused on stretching out your hip. This exercise may include heel slides that are focused on moving your how leg and hip (quadriceps, groin, hip, hamstring, calf and shin). Sometimes cardiovascular exercise, like using a stationary bike or treadmill, will be recommended under the supervision of your physical therapist. Why are hip injuries so hard to over come? In two words - scar tissue. Soft tissue in the hip is meant to be tough yet flexible, ready to work and move extreme forces in everyday activities. Damaged tissue heal with scar tissue; little tiny band-aids that overlap each other on the tissue mending the injury. With added scar tissue your hip becomes rigid, less able to receive the full force of your movements. If you're suffering with scar tissue now, you may feel the effects with stiffness, tightness, weakness and tiredness in your hip. Scar tissue can form fast to bring together the edges of a tendon, ligament of the tissue tear, but working fast doesn't mean that the job's done right. When scar tissue forms it doesn't come together as neatly as regular (healthy) tissue would. Scar tissue fibers will lay down over top of your tear in a cluttered, messy and jumbled up way. Stretching helps to break up scar tissue, ultimately reducing its troublesome effects on your body. Toward the end of your appointment your physical therapist may introduce cold compression, acupuncture, or TENS to relax your hip after the intense stretching and exercise. Our Hip Therapy Formula is Proven to Work! 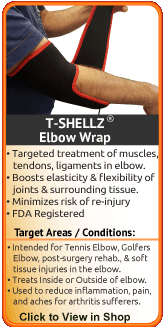 It may seem hard to believe, but our T•Shellz Wraps, ebooks and accessory products will assist you in recovering from your injury by reducing your swelling and inflammation induced pain, maximizing localized blood flow, and increasing the flexibility / range of motion in the hip. 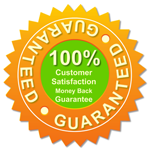 Guarantee #2 - You will not be left in the dark after purchasing any product from us. 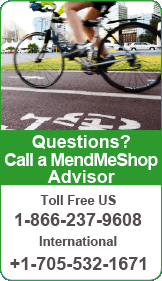 MendMyHip Advisers and Product Specialists are available 7 days a week by toll free phone 1-866-237-9608 or email to answer your questions or concerns.